A house that has decorative downlights on the ceiling looks more attractive and beautiful. Need stylish and attractive downlights? Blue ceramic downlights are the perfect solution for your home. They are made of durable material and they use energy-efficient bulbs. This definitely means that they are cost effective. One of the top necessities that you should prioritize when redesigning your house is selecting decorative and functional lights for your ceiling. Ceramic downlights are the best option for your ceiling if you want to make your home a place where you can be proud of. 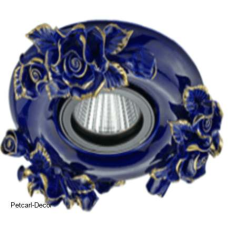 If you have been looking for the place where you can find blue ceramic downlights for sale, then Petcarl Décor is a reliable and genuine shop that you can always visit. We sell quality ceiling downlights that every client can afford. Whether you are looking for chandeliers or downlights to be fitted on your house roof, you can trust us to provide you.